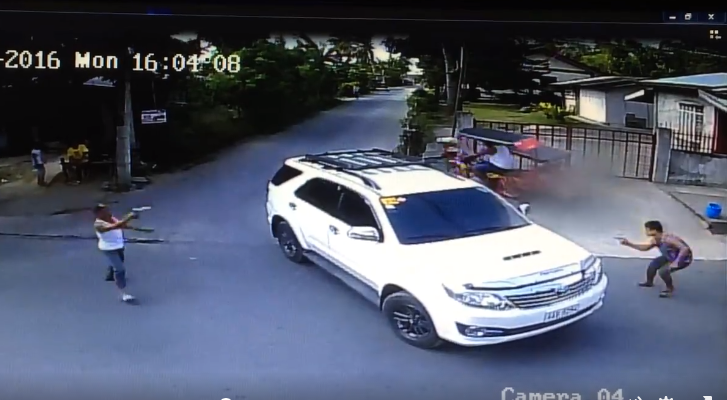 A closed-circuit television (CCTV) camera installed at a road intersection in barangay Tinurik in Tanauan, Batangas captured a shooting incident which led to the tragic death of one man. The time-stamp on the video showed that the incident occurred on March 21, 2016 (Monday) at around four in the afternoon. The video was originally posted on Tanauan City's Hope, a Facebook page. In the video, as traffic slowed down at the intersection, two men emerged into the camera's view as they approach each other from opposite directions. Each man was holding a handgun. They then started shooting at each other while a white car was sandwiched between them. Moments later, one of the bullets found its mark and the target crashed to the pavement. The fallen man tried to crawl on the ground and use the white car as cover but the other man was in quick pursuit. The incident ended when the man who was still standing uncorked several bullets into the fallen man. With the man on the ground not moving and visibly lifeless, the other man quickly fled out of camera view. The victim has been identified by the Tanauan police as Restituto Sode, 46 years old, and a resident of barangay Boot, Tanauan. On the other hand, the suspect has been identified as Petronillo Lascano, a resident of barangay Bagumbayan, also in Tanauan. According to the Tanauan police, witnesses told them that the two suspects were aboard their own Mitsubishi vehicles when they got engaged in a heated argument. 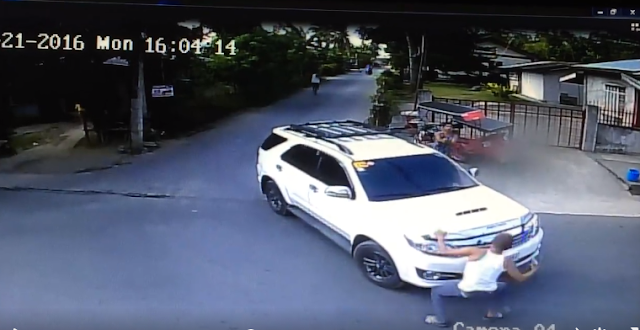 When they reached the intersection in Tinurik, the two men each alighted from their vehicles and started shooting at each other. 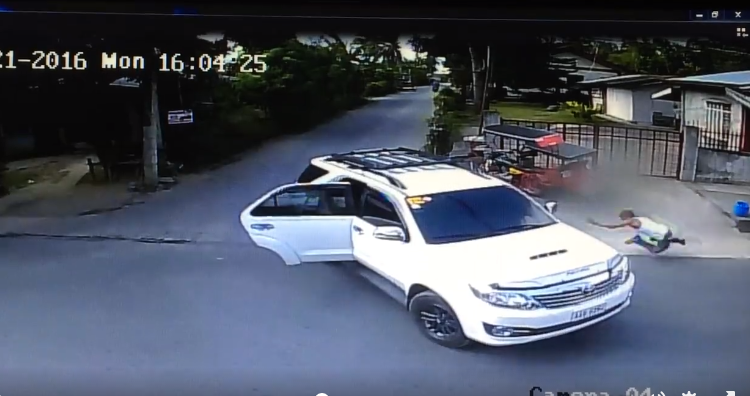 After the incident, Lascano quickly boarded his car which had three other passengers and they fled towards barangay Bagumbayan. Their car was found abandoned in front of a small grocery store in the area. Found at the intersection where the incident occurred are 22 bullet shells. *As the vehicular traffic slowed down at the intersection in Tinurik, these two men can be seen approaching each other from opposite directions. *They are both holding short handguns. *As the shooting gets heated, the two men tried to gain an upper-hand over each other by using the white car sandwiched between them as cover. *At one point, one of the passengers of the white car opened the car door and ran away for safety. *The two men momentarily disappeared from the view of the CCTV camera. When they reappeared, one of the men can be seen crashing to the ground, obviously hit. *The man pursuing the fallen man can be seen reloading his handgun at least two times. *Hit and unable to make his way to his feet, the fallen man tried to get away by crawling around the white car but the other man was in close pursuit, all the while shooting at the downed man. *With the man motionless, the suspect fired at least two more rounds before fleeing. Related News: Seven People Died During Three Separate Cases of Drowning in the Province of Batangas on Holy Thursday (March 24).